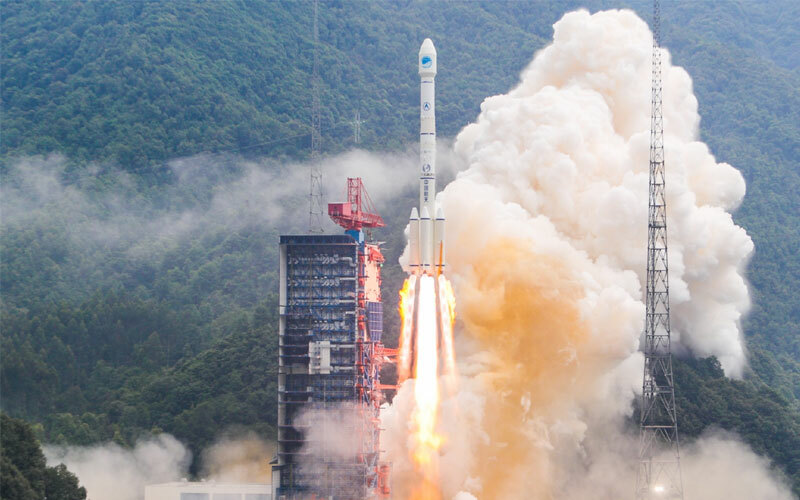 The Long March 3B is currently the most powerful variant of the Chinese Long March rocket family. The three-stage rocket features four strap-on liquid rocket boosters and is launched from Launch Area 2 and 3 at the Xichang Satellite Launch Center in Sichuan, China. The rocket was first introduced in 1996. An upgraded version, the Long March 3B/E or G2 was introduced over ten years later in 2007. The 3B/E is over a meter taller than the standard Long March 3B and is capable of deploying 5,500-kilogram payloads into a geostationary orbit, a half a ton improvement to the previous iteration. The rocket was launched for the first time on February 14, 1996. After clearing the tower successfully, it veered off course and smashed into the ground just 23 seconds after lifting off. Six people were killed in the explosion. After identifying the cause of the failure, the Long March 3B was launched successfully for the first time over a year later on August 19, 1997 deploying the Agila-2 into orbit. Since then, the rocket has secured a near perfect launch record suffering just two partial failures in over 50 launches.